Set up an ice bath. In a large saucepan of salted boiling water, cook the asparagus and peas until crisp-tender, about 2 minutes. Drain and transfer the vegetables to the ice bath to cool completely; drain well. Fill the saucepan with water and return to a boil; season generously with salt. Add the pasta and cook until al dente. Drain well and transfer to a large bowl. In a medium bowl, whisk the buttermilk with the mayonnaise, vinegar and garlic. Season with salt and pepper. Toss half of the dressing with the warm pasta; let cool for 30 minutes. Stir in the asparagus, peas and remaining dressing. 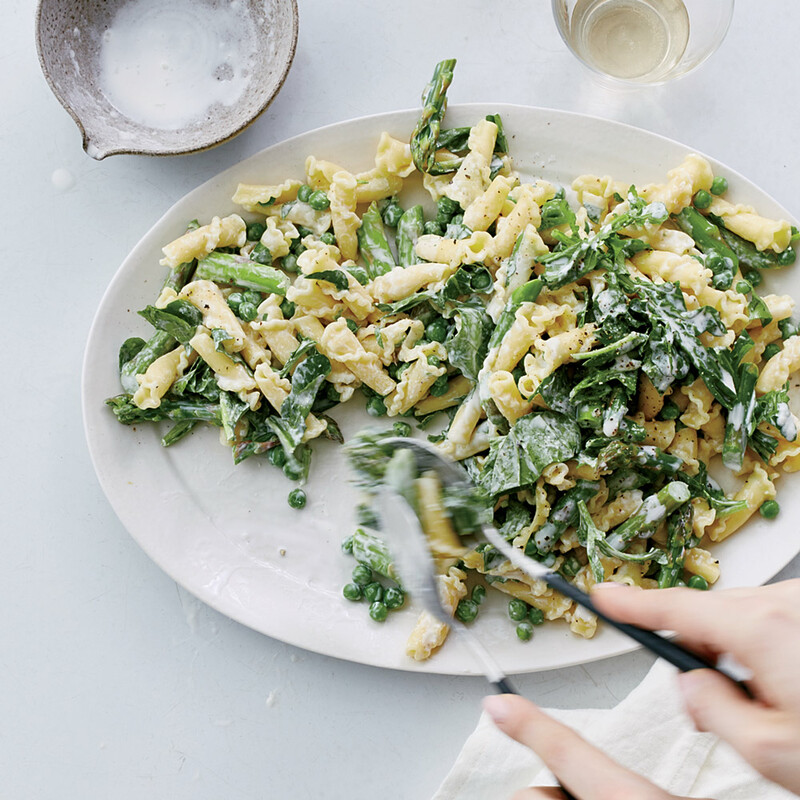 Season with salt and pepper, then fold in the arugula and serve. The pasta salad can be refrigerated for a few hours. Fold in the arugula before serving. Review Body: Minouchka ***** Supper duper, Healthy, easy and YUMMY! Review Body: Must do for anyone that loves pasta done in any style. Review Body: A friend made this salad and brought it my BBQ. It was great, light and refreshing and did not have that heavy mayo dressing. I searched the recipe on the FW site and will definitely make it myself!